I have been making a wood carvers mallet for a lad at the carving club, he liked the feel of the mallet I had made for myself a while back so I siad I would try to make its twin for him. I did not take many photos but will be making another one so will take more photos next time if anyone is interested. 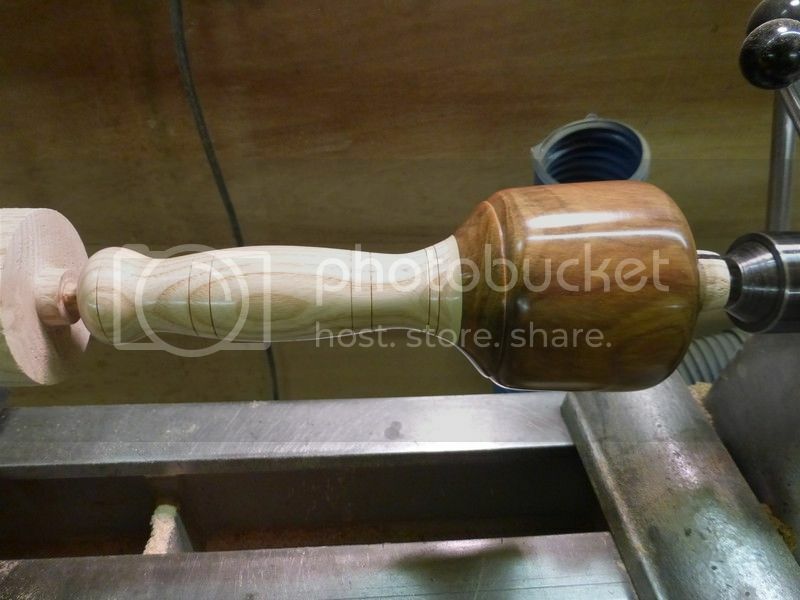 The shaft it ash and the head an old bowling ball made of Lignum Vitae a really hard heavy close grained wood. 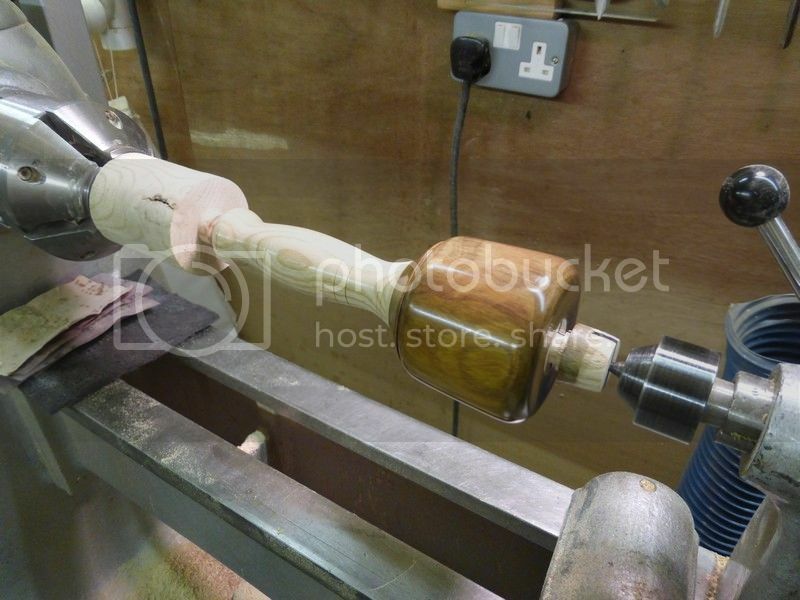 This is the mallet almost finished but still attached to the lathe by either end of the shaft before it is parted off. The mallets shaft blends into the shaft in a smmoth curve so it sort of rocks in your hand when doing light taps. This it along side the one I wanted to copy from , they are not identical but close enough. I have one but removed the minimum amount from the wood , it takes no priseners and has lost its shine over the last twenty years . Nice job looks nicely balanced. Just a few questions :- Is there a reason why carving mallets are circular, I would have thought they would more easily slip of the end of the chisels? Does the hole in the head go right through for handle then have a wedge in the end? Does the Lignum need to be turned using HSS , Carbide or can you use carbon steel turning chisels? Very nice work. Yes more pictures if you make another! I've set aside a lump of Brass to make a small carvers mallet. The joiner I served my time with used to do alot of carving as a past time. He used to say that apple wood was good for mallet manufacture...how true it is I dont know, but thought i'd pitch it in for thought/comment. Lignum Vitae was apparently used by John Harrison to make the bearings for his wooden clocks. Has anyone here tried using this wood for bearings ? David Meldonmech, I think the idea of the round head is when ever you pick it up its the right way around , opposed to a square headed one having to be in line, when you use it it does not seem to slip off the chisel top anyway in practice. The shaft does go right through and is glued with epoxy and wedged so not going to come loose, in the photo where it is still on the lathe its the end of the shaft sticking out that the centre is sticking into. Although the lignum is a really hard wood it turns really well, its weird stuff as it comes off like dry wax flakes and leaves a nice dry shiny finish, when sanded it clogs paper up but will brush off the paper. The shine on the head did have a touch of wax on it but it was really that shiny from just sanding with finer grits of paper down to P600. You could turn with carbon tools no problem. Stig , I think apple wood is also a recognised wood for carvers mallets, I have heard if you want a bigger size mallet a Lignum one gets too heavy and apple is still hard but lighter so you get the right size per weight ratio with it. Its probably got a softer feel to it as you tap I would think. Arablist, I will be making another so will post pics , I have also made a couple of'brass' that turned out to be phosphor bronze mallets, some say you should only hit the gouges wood handles with wood so clas the brass ones as stone carvers mallets but I think either would do the job myself. David , The wood is used for bearings and if you look it up on wikipeadia it has been used on the propeller shafts of a neacular submaines as well as many other high tech stuff so seems to be perfect for the job, it would seem it was also used on brackets to hang power lines and after some fire it had withstood heat that had buckled the metal poles it was attached to.............it is an amazing wood and is also beautiful to look at. I will be making another one soon so keep checking back. I can see a smaller head may be better for delicate work. I do admire those mallets. Slightly but I understand that in windmills and water-mills, the gear-wheels often had inserted teeth made of apple wood. You can buy Nylon mallets for stone masons same shape , there chisels don't have handles one of the chaps had one when I worked at Stevensons Rocking Horses . Historically I believe stone carvers used wooden mallets. Wooden mallets were cheap and didn't damage the metal chisels which were more expensive. These days though you can buy wood, plastic or metal mallets for both wood or stone carving. Soft iron seems more popular than brass for stone carving though for some reason. 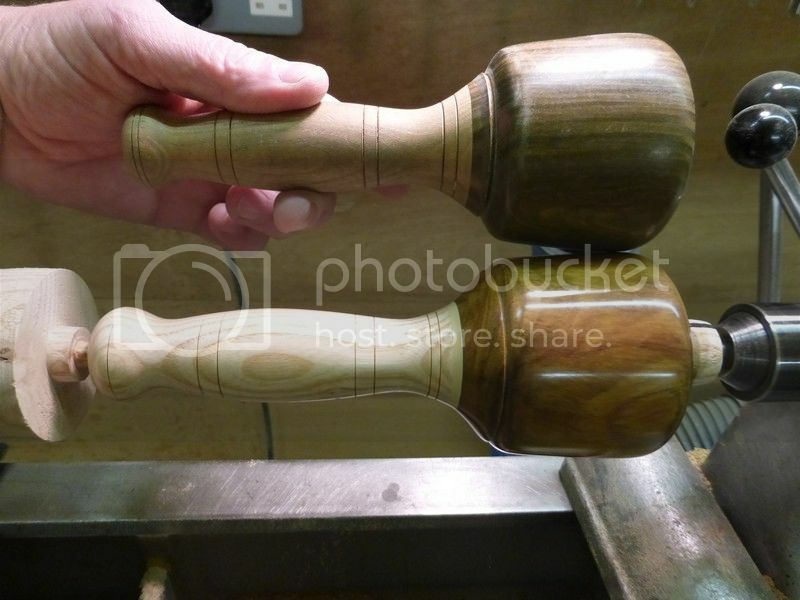 Hi Lads , I think the bottom line is any mallet hitting a tool will work , it just seems to be certain types of trades prefer certain types, There are say 55 peole in total go to the wood carving club and I don't think a single one uses a brass mallet they all use wood and maybe one or two the nylon type. I am sure a brass one would do the job so maybe its as simple as because no one has a brass mallet no one else gets one ? From a practical point of view most carvings getting done at the club are in lime ( basswood ) so do not take a real hard hit so a lightish wood mallet is fine for the job , probably of any wood. I think the Lignum 'V's Apple etc is probably because the carvers of old using a mallet 7 days a week all day probably wore out the Apple quickly compared to the Lignum and you know what its like getting used to a new handtool compared to one that has 'become part of you' . No doubt the stone masons having steel over brass will be for the same reason maybe ? I have a carvers mallet that was my great(x3) grandfathers. It's made of from a hard maple burl. Still works. That's interesting that nearly all the guys at your club use wood Mick. Some well known brands like Veritas, Pfeil and Two Cherries offer several sizes of Brass mallets for wood carving, makes you wonder how many they actually sell!? I suspect the kindest ones to use on your chisels are actually the Urethane ones? Not sure whether I should use that lump of Brass now for a Mallet! I use my urethane mallet from woodcraft most frequently. It is a bit quieter.